Promotes relaxation and dilation of blood vessels. Contains natural ingredients studied for their effects on hypertension. 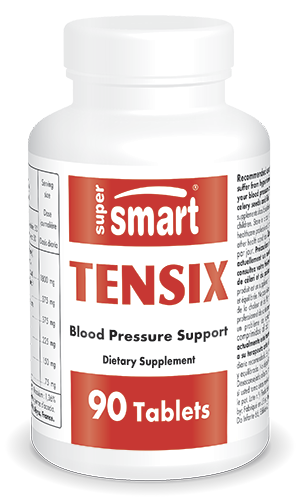 Tensix contains essential nutrients and natural ingredients which act synergistically to help regulate blood pressure. They promote relaxation and dilation of blood vessels as well as renal excretion of sodium, protect against free radicals, and inhibit ACE (angiotensine converting enzyme) activity and production, all mechanisms likely to improve blood pressure. - celery seed extract contains ingredients which dilate the blood vessels. They lower blood concentrations of stress hormones which cause the blood vessels to constrict.